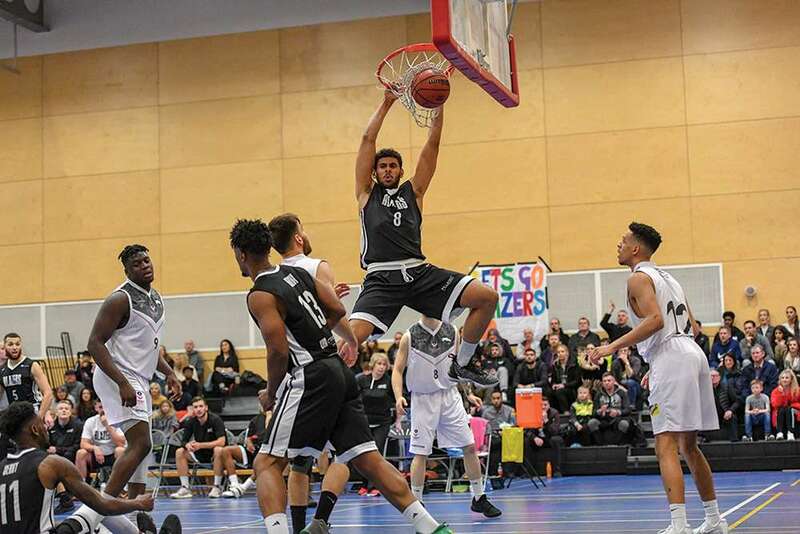 Derby Trailblazers seven game unbeaten run was brought to an unwelcome conclusion by Loughborough Riders, who ground out a 92-83 away win at the Clarence Wiggins Sports Centre on Saturday night. The bulk of the damage was done in the fourth quarter, a period which the Riders took 27-16, but the problems were apparent much sooner. Derby were out-rebounded 49-32 overall and 15-5 at the offensive end and it’s never easy to win in such circumstances. Added to that, the Trailblazers specialist three-point shooters didn’t hit a single long range shot and combined for just two points overall. As a team, Derby shot 29.4% from behind the arc, while Loughborough netted 43.8%, with Jonas Dieterich leading the way with six out of twelve and on his way to a team-high twenty points. “I thought Loughborough played very well and they are tough to stop, as we have found out to our cost on two of the three occasions we have faced them this season,” admitted the Trailblazers Head Coach Matt Shaw. “They have so many threats and we didn’t do well enough on the glass or score enough three-pointers on the night. Unfortunately, they excelled in both of those areas and that was the real difference in the game,” he said. Derby were led by Malcolm Smith, with 29 points and eight rebounds, Isa Brandon with 22 points and seven rebounds, Kayne King, who was closest to a double-double of 12 points and nine assists and Tre Wilford who finished with eight points and seven assists. For the Riders, Dieterich added eight rebounds, but it was Niall Harris who arguably produced their best performance of the night, finishing with 17 points, 13 rebounds and four assists. Loughborough got off to an excellent start, with a barrage of three-pointers coming from Dieterich (3) and Harris (1), which saw them open a 14-4 lead and force Derby into a time-out after less than four minutes. Six points from Smith and a three-point play from Brandon helped cut the gap to 18-13, before a basket from Alex Roberts and another long range strike from Harris restored a ten point advantage for the Riders, with 2’54” on the clock. Smith’s three-point play was cancelled out by a triple from Reiss Pinnock, before consecutive scores from Smith and Brandon were followed by a three-pointer for Brandon, meaning Derby were only 26-23 down at the end of the first despite their poor start. second period with his only three-point basket of the night, courtesy of an assist from Brandon. Thereafter, Riders dominated the early stages of the second, with Kyle Jimenez coming off the bench to score from both sides of the arc and give Loughborough their biggest lead of the period, at 43-35. Derby responded with a 9-2 burst which included a three-point play from King and a full court pass from Brandon to Smith, to trim the gap to just a single point. The run was ended by another triple from Dieterich, but a pair of free-throws from Oli Stanley and another score from King meant the scores were tied at 48-all going in the break. The third quarter was unquestionably the best things got for Derby, despite another shaky start to the period. King’s opening three-pointer was followed by a 10-2 run for the Riders in which Roberts scored eight of the points. A Derby time-out with 6’57” on the clock followed and suddenly things started to click into place for the Trailblazers. They managed to get Smith into good scoring positions and he added a pair of free-throws and four points from open play. Stanley also added a pair from the line and King completed a coast to coast drive to conclude a 10-1 run and take the score to 63-60. Loughborough halted the run with a triple from Christofis, before baskets from Smith and Benson Arogbo either side of a pair from the stripe for Roberts ensured Derby took a 67-65 lead into the final quarter. It was position from which the Blazers ought to have won, but a dreadful start to the fourth saw them held scoreless for almost five minutes. The Riders piled in fourteen unanswered points as Derby missed a trio of three-point opportunities, four inside baskets and a pair of free-throws, as well as turning the ball over twice. The run was eventually halted by Wilford making one of two at the line, but it was effectively all over for the Blazers by that point. Brandon hit a pair of late triples and three of three at the line, but Derby could get no closer than eight points, eventually going down 92-83. Derby: Smith 25, Brandon 22, Wilford 8, King 12, Stanley 6, Ward-Hibbert 2, Arogbo 4, Wesselingh 0, Brown DNP. L’boro: Dieterich 20, Harris 17, Pinnock 17, Roberts 12, Christofis 11, Jimenez 7, Forsyth 6, Kitenge 2, Haggith 0, Panaretakis 0, Yome 0.